Editor's note: When they began studying Islamic art "some 30 years ago," say Boston College fine arts professors Sheila S. Blair and Jonathan M. Bloom, "there were no good introductory textbooks that undergraduates could read." Ten years later, as they embarked on their teaching careers, "there were still none, and we had to make do with stacks of photocopied articles and chapters assigned from one book or another." That is how the professors have described their early days in a field that is still, they say, in the formative stage of development. Individually and together—the pair are the married coholders of BC's Norma Jean Calderwood University Professorship of Islamic and Asian Art—the two have gone some way toward filling the empty shelves. Between them they've authored or edited a dozen books on Islamic art and culture, including four written together. Sadly, as Blair and Bloom note, nothing has done more to boost the study of Islamic belief and culture, including art, than unsettling world events, from the oil crisis of the early 1970s to the emergence of radical Islamic terrorists. Recently, BCM invited Professors Blair and Bloom to select works of art that offer telling insights into the Muslim worldview. 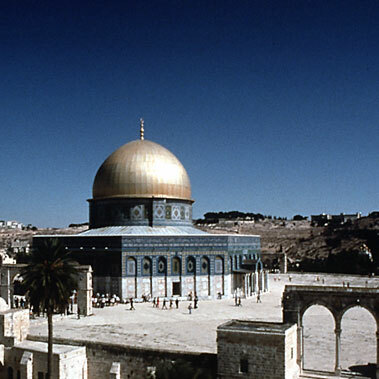 The Dome of the Rock (above), standing in splendid isolation atop the Temple Mount in Jerusalem, is the first major work of Islamic art and architecture. When Muslim Arab armies conquered Jerusalem in 638, the area of the Temple Mount—the traditional religious center of Jerusalem, the locus of Adam's burial, Abraham's sacrifice, and the temples of Solomon and Herod—lay in ruins, as Christians had focused their attention on other parts of the city. Muslims identified Jerusalem as the "furthest place of prayer," from which the Prophet Muhammad made his miraculous night journey to heaven, mentioned in chapter 17 of the Koran. The Dome of the Rock was commissioned in 692 by the Umayyad caliph Abd al-Malik, 60 years after Muhammad's death. The architect is now unknown, but he was most certainly acquainted with late antique and Byzantine construction. In typical Byzantine style, columns of pink and green marble, together with stone piers sheathed in plaques of white marble veined with gray, support the structure's stone arches and walls, which also are covered with marble plaques or with colored and gilded glass mosaics that sparkle in the light. An eight-sided building, the Dome of the Rock has a 115-foot domed central space, more than 60 feet in diameter, encircled by a relatively low (30-foot) ceilinged space so wide that it is subdivided by an arcade. The dome is wooden, with a metal roof, originally lead, plated with gold on the outside. A narrow band of Arabic inscriptions—in glass mosaic of gold letters on a blue background—runs for some 800 feet along the top of the arcade. The text, largely from the Koran, explains Islam and refutes the tenets of Christianity (for example, from Koran 112: "There is no god but God alone, without partner. Say: He is God, One, God, the Everlasting, who has not begotten and has not been begotten"). The building, the text suggests, was meant to advertise the presence of Islam in a city full of important monuments to Judaism and Christianity. By its location and even by its shape—which echoed the design of the Church of the Holy Sepulcher on the spot where Jesus is said to have been buried—the Dome of the Rock announced Islam as the worthy successor to the earlier monotheistic revelations. Contrary to popular opinion, the Koran does not ban human or animal representation (conservative Islamic legal opinion weighed in against their depiction in religious contexts only centuries later). Yet no human or animal appears in the building's mosaics. Muslims believe that God is unique and without associate and therefore cannot be represented. God is to be worshiped directly, without intercessors, so there is no need for saints. And since the Koran contains little in the way of narrative, especially compared to the Bible, there is no call to depict stories, as Christian artists often have done in their religious art. As for the fantastic trees, plants, fruits, jewels, chalices, and crowns filling the building's mosaics, their message is a matter of scholarly speculation today. Byzantine artists had used such motifs to set off, frame, or link their human or divine figures. The same artists, when employed by Muslim patrons, as they often were in early Islamic times, may simply have turned what had been subsidiary elements in Christian art into their main subject. Because wood was precious in the arid lands of North Africa and western Asia, craftsmen throughout the Muslim world used it to make the one article of furniture required in every congregational mosque—the minbar. From the minbar, a stepped pulpit, the preacher gives the sermon at Friday noon worship. Derived from the judge's chair of pre-Islamic Arabia, the minbar became a symbol of authority for early Muslims, somewhat comparable to the bishop's cathedra in the Christian tradition. The minbar from the Kutubiyya Mosque of Marrakesh, in southern Morocco, is perhaps the most beautiful of all examples to survive from the medieval period. It was ordered, according to a newly deciphered inscription on its left side, at Córdoba, Spain, on September 19, 1137 (the first day of the Muslim lunar year 532), for the congregational mosque in Marrakesh. The patron was likely the Almoravid sultan Ali ibn Yusuf, whose long reign (1106-42) was one of the most brilliant in the history of the Muslim West. Marrakesh was the political capital of the sultan's realm, whereas Córdoba was its intellectual, social, and artistic center. This minbar, which stands nearly 13 feet high, 11 feet deep, and three feet wide, was prefabricated so that it could be transported in pieces the hundreds of miles from Spain across the Strait of Gibraltar and over the Atlas Mountains. 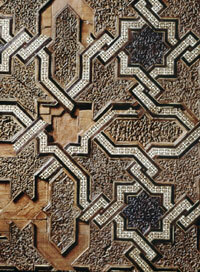 Every visible surface of the Kutubiyya minbar was originally an intricate web combining inlay and marquetry (wood mosaic) with carving. On the flanks, stars of African blackwood, hexagons of tan boxwood, and frog-shapes of reddish jujube are enclosed in a strapwork pattern of precious woods and bone. The vibrant result (see illustration at left) resembles tile wall mosaics from contemporary Moroccan architecture. Some of the carved panels measure several inches across, but many of the pieces from which the decoration is composed are smaller than a grain of rice. The structure originally was comprised of more than 1.3 million pieces of wood. Within decades after it was begun, the minbar was used in three different mosques in Marrakesh; two were destroyed after claims that they did not point exactly toward Mecca. It was finally transferred to a new mosque that came to be known as the Kutubiyya (Booksellers') Mosque because of the dozens of bookshops that surrounded it. 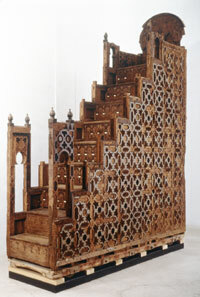 There the minbar stood until the 1960s, when it was moved to the city's Badi Palace Museum. Muhammad's contemporaries understood the divine revelation to be an oral text. God's first instruction to the Prophet begins, "Recite in the name of thy Lord." The Arabic word qur'an, from which we derive our English word Koran, stems from the root meaning "to recite or read aloud." But either during the Prophet's lifetime or soon after his death in 632, Muslims began to transcribe the revelations. Thousands of early parchment fragments survive, but as with the example below, not a single one bears any indication of date or place. The page we've chosen is from a dispersed manuscript penned in a brown ink prepared from gallnuts and ferrous compounds on parchment made from sheepskin. It contains the last two verses of chapter 38 ("It is nothing but a reminder unto all beings, and you shall surely know its tiding after a while") and the beginning of chapter 39 ("In the name of God, the Merciful, the Compassionate. The sending down of the [Book is from God, the All-mighty, the All-wise]"). As a complete Koran, this manuscript would have filled several thousand pages, and been comparable in length to the entire Gospels. Arabic is not easy to read. Unlike Greek, Latin, Hebrew, Russian, and English, it is rendered only in "cursive" form—with many, though not all, letters connected. Arabic letters change their shape depending on their position in a word: The same letter can have one form when it stands alone, another at the beginning of a word, another in the middle, and yet another at the end. Breaks can occur just as easily within as between words, and early writers such as the scribe who composed this page did not distinguish between the two kinds of spaces. Furthermore, Arabic script imperfectly represents the spoken word. The language has 28 distinct sounds, but the script uses only 18 characters to represent them. From an early date, extra strokes were sometimes used to differentiate sounds sharing the same letter shapes, but Koranic calligraphers—particularly in the first centuries of Islam—often deemed these marks superfluous. Lastly, Arabic script, like Hebrew, records only the three long vowels, leaving it to the reader to interpolate the three short vowels, silences, and case endings from the context. Some calligraphers, like the artist of this page, used systems of colored dots above and below the letters to indicate the unwritten sounds. All of these peculiarities, which make reading extremely difficult and slow, indicate that early Arabic texts like this one were primarily memory aids, meant for the use of a public reader who had already memorized the text. Pictures of Muhammad are extremely rare in Islamic art. The image linked above, portraying the birth of the Prophet, comes from an illustrated copy of the Compendium of Chronicles, a four-volume history of the world's peoples compiled in the early 14th century by Rashid al-Din, vizier to the Ilkhans, the Mongol rulers of Iran. The Ilkhans, who had only recently converted to Islam, were descended from Genghis Khan and were cousins to the Mongol dynasties ruling in China, Central Asia, and southern Russia. Together they brought much of Asia under a Pax Mongolica. Rashid al-Din was an Iranian Jewish convert to Islam who had started his career as court physician. In his account, begun at the sultan's request, he relates the histories of the Mongols, Turks, Chinese, Franks, Jews, Indians, and Muslims. As part of a pious bequest, he stipulated that scribes were to produce Persian and Arabic copies of his works each year, for distribution in the major cities of the Ilkhanid realm. 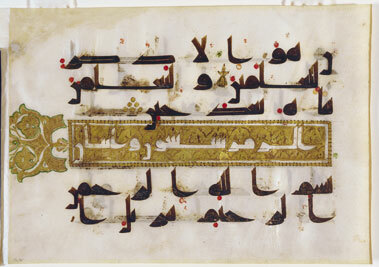 The depiction above is from one of the few surviving Arabic copies produced in his lifetime. The Ilkhans seem not to have shared their fellow Muslims' inhibitions about representing the Prophet. Indeed, the manuscript is remarkable for its profusion of illustrations, which include portrayals of the biblical prophets Jonah and Noah, as well as Chinese emperors and Muslim heroes. The idea for the birth scene probably came from illustrations of the Nativity in Christian art, since the birth of the Prophet has no theological significance for Muslims—Muhammad was human, not divine. Modeled perhaps on a Byzantine panel-painting, the broad, strip-like image is divided into three parts. The center shows the infant Muhammad cradled by two angels while his resting mother is attended by midwives. In the right-hand compartment sits an aged figure with a staff—the Prophet's uncle, Abu Talib, standing in for the figure of Joseph. At left, three women are posed together—echoes of the Magi in Christian Nativity scenes—and a fourth stands huddled over a stick. None of these supporting characters figures prominently in the vizier's text, which concerns the exact date of the Prophet's birth. The artist's technique, in which line drawing is heightened with colored washes, derives from Chinese painting, and came to Iran with the Mongols. In this seminal manuscript, disparate artistic elements of East, West, and Middle East cohabit somewhat uneasily. Within a few years, however, Iranian artists would develop an original style, as if—one contemporary chronicler noted—a "veil was lifted from the face of Persian painting." Islamic art is often thought to have ended during the 19th century, as European-manufactured imports replaced local craft goods in centers of Islamic culture. In the 20th century, Western culture came to dominate intellectual and artistic life in the nations that emerged in North Africa, the Middle East, and South Asia following the collapse of colonialism. Artists responded to these changes in many different ways, some aping Western traditions wholesale, others repeating old formulas endlessly. The most successful developed styles that combined indigenous and foreign artistic traditions. 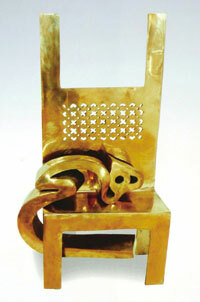 One of the first to do so was the Iranian sculptor, Parviz Tanavoli. Born in Tehran in 1937, Tanavoli became in 1956 the first student to graduate from the new program in sculpture established in the College of Fine Arts at Tehran University. He then studied in Italy and was a visiting artist at the Minneapolis School of Art. After returning to Tehran in 1964, he became connected with the Saqqakhane art movement, named for the public water fountains found in many communities. Providing water is considered a very pious act, particularly among the Shia. The saqqakhana (literally, the water-carrier's house) can be a little building or niche in a wall, or even just a shelf containing a tap or fountain or jug, usually set behind an iron grille. Passersby can not only quench their thirst but also ask for fulfillment of pious requests after leaving a small votive gift—often a padlock signifying a binding vow. The movement's members used Iranian folk art themes—locks attached to grilles, for example—as inspiration for their work, which they typically executed in Western-inspired media, such as collage, oil paint on canvas, and cast bronze. Tanavoli has worked in a range of materials, from bronze, copper, brass, and scrap metal to clay, and in a range of sizes, from finger rings to large public sculptures. Tanavoli's most famous theme is the sculptural representation of the Persian word heech, meaning "nothing" and spelled with the three letters heh, yeh, and cheh. In one of his most popular versions of this theme, the word is set like a crouching cat on a chair-like support, whose latticed back recalls the grille of the saqqakhana. The cat's head is comprised of the initial letter heh, known in Persian as the "heh of two eyes" because of its two loops. The letter yeh comprises the cat's neck, and the letter cheh, its body and tail. The word thus becomes a complex visual pun, appearing to represent something but saying "nothing." Sculpture is relatively uncommon in Islamic art because of the longstanding prohibition against idolatry. But it was an important art form in Iran for centuries before the Muslim conquest in the seventh century, when the Persian language came to be written in Arabic script. Tanavoli has combined in cast bronze the traditional Iranian love of figural sculpture with not only the Islamic reverence for the written word but also a 20th-century taste for abstract art. Professors Blair and Bloom are the joint authors of Islam: A Thousand Years of Power and Faith (2000) and The Art and Architecture of Islam: 1250–1800 (1994). Jonathan Bloom has also written Paper Before Print: The History and Impact of Paper in the Islamic World (2001). An excerpt of the latter, which has garnered numerous academic book awards, appeared in the Spring 2002 issue of BCM.